As your carabiner and climbing harness are the items that help to keep you connected to the rock, it is absolutely crucial to evaluate these pieces of outdoor gear and clean them on a regular basis. If you are in any doubt as to the safety of your carabiner or harness, it’s best to replace it immediately. Harnesses that are well worn are not automatically dangerous, but excessive discolouration and fraying of the webbing usually means that it needs to be retired. Some harnesses come with orange markings that indicate when the climber needs to replace it. 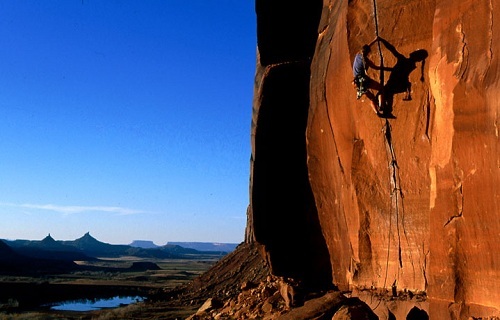 As with most outdoor gear, the structural materials of all harnesses will degrade as time goes by and so, to ensure that you’re safe during your climbs, always replace harnesses that are more than seven years old, even if they have not been used very often. 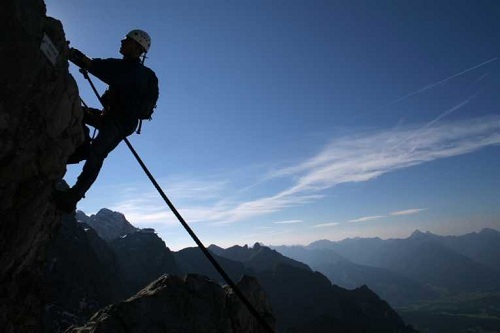 Those who climb on a weekly or even a daily basis, such as mountain guides, should replace this piece of equipment after a year and all climbers should replace their harnesses after a major impact or fall. When your harness becomes dirty, a simple rinse under tap water will normally be enough to wipe away surface dirt. However, if you find that this does not remove all of the dirt particles, then you may want to wash the harness in a tub of warm water and use a cap full of mild soap. Allow the harness to air-dry, away from strong sunlight. Harnesses should always be transported in the special bag that they are sold in and kept away from corrosive substances such as bleach, petrol and solvents, as well as sharp objects. Store the harness in a dark, dry place away from any potential contaminants and if it becomes damp, make sure to dry it before placing it in a dry cupboard. Carabiners will play a very important role in any climb; to ensure your own safety, as well as the safety of those you are climbing with, you should inspect and clean them regularly. Check the surfaces of the carabiners for excessive wear, corrosion, sharp edges and cracks; even a tiny little hairline crack can reduce the strength of the carabiner significantly. Make sure that none of the rivets are missing or bent and check that each gate opens and closes easily. All gates should close properly; if the gate doesn’t function as it should, the carabiner must be replaced. Much like with a harness, any carabiner that has been dropped a great distance will need to be retired; remember that a dropped carabiner might be damaged, but appear intact, so if you are in any doubt, do not use it. Carabiners’ gates can be cleaned by blowing out the dirt and dust from around the hinge area. If you spot a sticky gate, try washing it in soapy warm water, rinse it thorough and allow it to air dry. Carabiners also need to be lubricated; this can be done with any waxed based dry lubricant. Simply wipe it around the hinge section, the locking mechanism and the spring hole. Keeping your outdoor gear in tip top condition will help keep you safe. This guest article brought to you by Urban Rock, the UK’s leading climbing and outdoor equipment specialists. This entry was posted in Land Sports, Rock Climbing and tagged Caribiners, Climbing Gear, harness, Rock Climbing, Ropes. Bookmark the permalink.